The Beth Fowler Dance Company will present its 24th Annual production of “The Nutcracker”. Many area families have made this magical production a part of their holiday tradition every year. 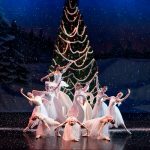 With the beautiful dancing, costumes and stage sets, this favorite holiday classic will tell a story that will make everyone feel like a child at Christmas. With the wave of the Christmas Fairy’s magic wand, she makes visions appear of young Clara and her family celebrating Christmas! When the Christmas Eve party guests leave, Clara falls asleep and dreams of toy soldiers and rats battling in her living room, then adventures through a Snowy Forest to the Land of the Sweets. Overwhelmed by her adventures, Clara wonders if it was all just a dream! For not-for-profit groups (scouts, etc.) of 10+ please contact the box office for discounted group tickets. Ticket prices increase November 28. For more information visit egyptiantheatre.org.